Maximum: Maximum allowed members in this institution. Click the Edit button to change institution settings. Click the Delete button to delete an institution. You can only delete an institution when there are no members in it. Click the Edit members button when you want to add or remove members from an institution. Click the Edit staff button when you want to add or revoke staff rights for an institution member. Click the Edit administrators button when you want to add or revoke institution administrator rights for an institution member. Institution expiry date: Set the expiry date for this institution by selecting the year, month and day from the drop-down menus when taking the check mark off the “Not specified” check box. Institutions do not expire by default. If the auto-suspend expired institutions option is set, then once the expiry date has been reached, this institution will be automatically suspended, and users of this institution will no longer be able to log in. Registration allowed: Check this box when you want to allow self-registration of new users. As institution administrators, you will be asked to confirm that users can join your institution. If you decline, their new account will be associated with “No institution” unless you have the Confirm registration option clicked. When you do not allow registration, nobody can register a new account, ask to join your institution or leave it without your permission. Confirm registration: Check this box if you want to control that no new accounts are created unless the administrator approves the registration. You receive a notification about pending registrations when a new user wants to register. Institution online: Only institution members are displayed in the side block. Require license information: If you check this box, your institution members will need to choose a license for each artefact they upload or create. They can set a default license in their account settings. You only see this option if the site administrator turned License metadata in the general site settings. Default license: You can choose a default license for your institution members’ content. They can overwrite this default license in their account settings. You only see this option if the site administrator turned License metadata on in the general site settings. If the site administrator allowed custom licenses, you can enter one using the drop-down menu option “Other license (enter URL)”. This license can then also be used by your institution members. Update user quota: If you check this box, the default quota you choose above will be applied to all existing institution members. Allow institution public pages: Put a check mark into this box if you want to allow users belonging to this institution to create portfolio pages that are accessible to the public rather than only to logged-in users. If you allow public pages, users can also create secret URLs for their pages. Otherwise they cannot. Locked fields: Put a check mark into each check box for which users are not allowed to change the value. Disabled check boxes are for profile fields which are locked in the institution settings for “No institution”. These profile fields are locked at the site level and cannot be unlocked for individual institutions. Click the Submit button to save your changes and create this institution. Click the Cancel button to abort the creation of this institution. You can upload a logo to any theme replacing the standard logo that comes with the theme. For best results, this image should have the same dimensions as the site logo in your institution’s theme. As each theme can have a different header height, no exact dimensions can be provided. Of the standard themes, only the “Primary School” theme requires a set height for its logo. The other themes are more flexible. Logo: Upload the logo that you want to use on your institution theme from your computer. Delete logo: If you want to revert back to the standard logo, check this box and click the Submit button at the bottom of the page. Background: Background colour for the entire site, esp. visible in the header and footer. Text on background: The text that is displayed on the background colour, e.g. in the header and footer. Link: The link colour on any pages unless it is in the sidebar or navigation. Sidebar background: The background colour of any sidebar. It should form a good contrast to the heading colour of the sidebar as that is always white. Sidebar content background: The colour of the inside of a sidbar. Sidebar link: The colour of a link inside a sidebar. Sub navigation background: The colour of the secondary navigation and the highlighted section in the main navigation bar. Sub navigation text: The colour of the text / links in the secondary navigation and the highlighted section in the main navigation bar. Row background: The colour of the background anywhere rows appear. Colour picker: Either type in the hexadecimal colour code directly into the colour field or use the cross and arrow from the colour picker to decide on your new colour. 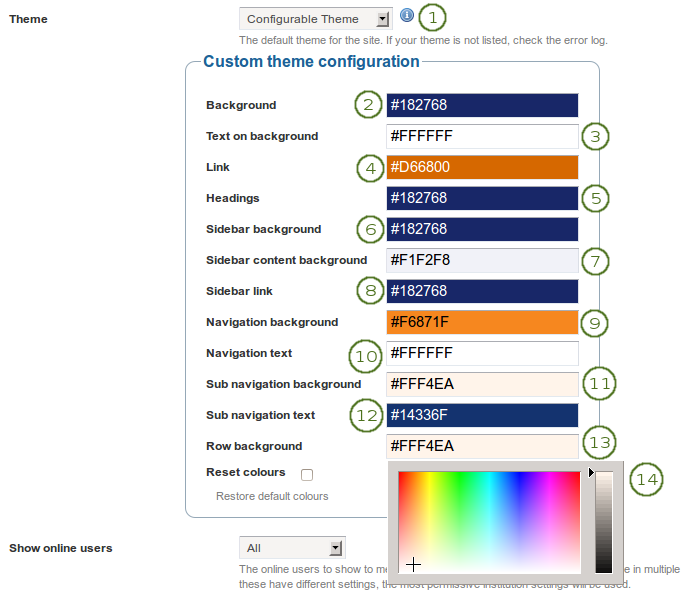 Reset colours: If you want to go back to a blank slate of the configurable theme, place a check mark in this box to get back to the original colours of the configurable theme. You can add multiple authentication methods to your institution and thus allow various entry points for your users. You should set up at least one authentication method. Otherwise, nobody can log in to this institution. Once your institution is created, the settings include an additional option, Authentication plugin. You see all authentication methods that are already in use for this institution listed. IMAP: User accounts are authenticated against an IMAP server. This is the least maintained authentication plugin and rarely used. internal: User accounts are created by Mahara and the passwords and logins are kept in an internal database. This is the default authentication method for a new institution. LDAP: User accounts are authenticated against an LDAP server. 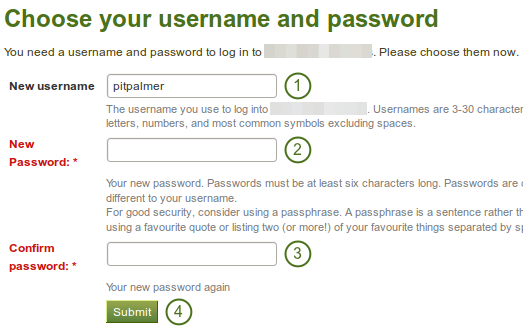 none: Anyone can log in by picking a username and password. This should only be used for testing. Persona: User accounts are authenticated against Persona. Click the Submit button to enable this authentication method or click the Cancel button to abort your changes. Use this authentication method to authenticate against an LDAP server so that your users can log in with their usual login and password. TLS encryption: Check this box if you use this encryption mechanism. 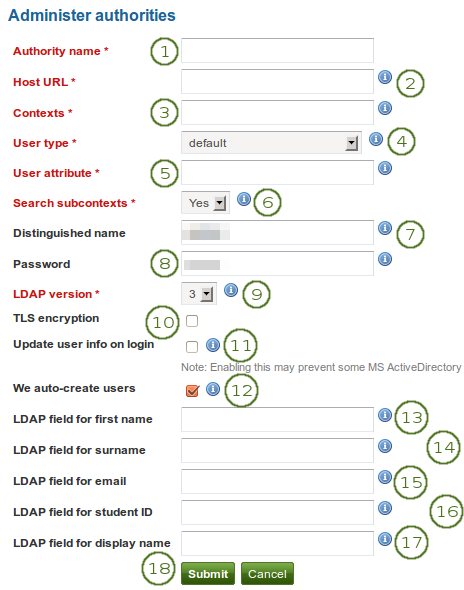 Update user info on login: Check this box to update the first name, last name and email address with the corresponding LDAP values at each login. Enabling this option may prevent some MS ActiveDirectory sites / users from subsequent Mahara logins. We auto-create users: Check this box to create user accounts on Mahara automatically when a user authenticates successfully but does not yet have an account. Persona is a project of the Mozilla Identity Team. It allows people to have one login across multiple sites without having to divulge the password to these sites. All they need to log in to a Persona-enabled site is their email address. We auto-create users: Place a check mark in this box if you wish to allow new users to register for your institution automatically using their Persona credentials. The normal registration work flow and the potential confirmation of accounts does not come into play when you allow the auto-creation of accounts as this is an external authentication that is then considered to be trusted. We recommend you do not use the auto-creation of accounts unless you a sure that only trusted people can register. Otherwise, anybody with a Persona account could register on your site. This option could be used when your site is only available in an intranet or you want to allow anybody to register. Users with a Persona account can go through the regular work flow of registering their accounts if the administrator allowed the registration for their institution (and requires the confirmation of accounts). If users have internal accounts and later link the email addresses they use to a Persona account, they can also log in with their Persona credentials when the site administrator allowed the Persona authentication in their institution. Institution value to check against attribute: Enter the value that will be checked against the institution attribute value as passed from the IdP. If the institution regex check box “Do partial string match with institution shortname” is selected, this value can be a regular expression that will be used to check against the institution attribute value. This field is required. Do partial string match with institution shortname: Check this check box to treat the value in “Institution value to check against attribute” like a regular expression. Match username attribute to remote username: This box is selected by default and needs to stay selected. It matches the user attribute value to the remote username field assigned to a given user (not the internal Mahara username). Only if you have the experimental feature of “usersuniquebyusername” turned on can you deselect this check box. We do not recommend this unless you are very experienced and have control over all applications in question. 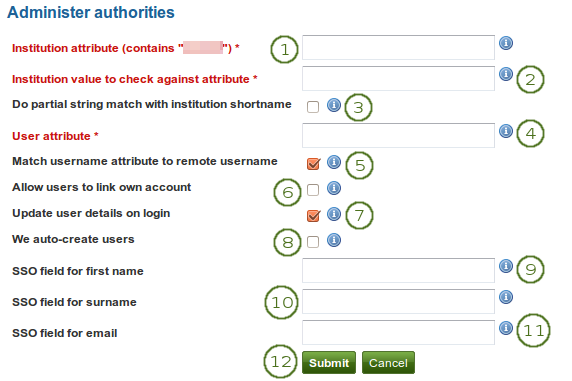 By default, SAML authentication instances have the “Match username attribute to remote username” setting selected. If that setting were unchecked, someone with control over any SAML identity provider could gain control over any user account on that Mahara site by setting the username attribute accordingly. In other words, administrators of one institution could control users in other institutions. You would only be able to deselect this setting if you set the “usersuniquebyusername” variable to “true” in config.php. However, you should not do that on a Mahara instance to which multiple SAML providers connect and you are not in control of all usernames that are created. If you deselect “Match username attribute to remote username”, you get an error message which talks about the config setting for “usersuniquebyusername”. Please refer to the experimental feature of the “usersuniquebyusername” variable for more information. 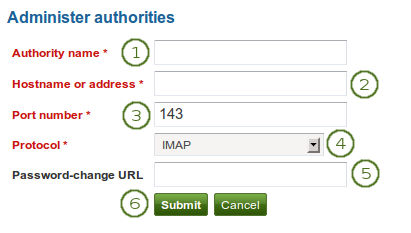 Allow users to link own account: Check this box if you want to allow users to link their own internal Mahara account to the authenticated SAML account. This depends on the “Match username attribute to remote username” option being enabled. If this setting is turned on when users try to log in via SSO and their username as well as the email for example match an internal username, they can link their accounts. That would allow them to log in either via the SSO login or via the regular login box into the same account and avoid account duplication. Update user details on login: Check this box to update the first name, last name and email address with the corresponding IdP values passed through at each login. We auto-create users: This is unselected by default and needs to stay unchecked if the option “Match username attribute to remote username” is enabled. Check this box to create user accounts on Mahara automatically when a user authenticates successfully but does not yet have an account. Only if you have the experimental feature of “usersuniquebyusername” turned on can you select this check box. We do not recommend this unless you are very experienced and have control over all applications in question. WWW root: Enter the web address of the root of the remote application, e.g. http://example.com. This field is required. Application: Choose the application on the other end. You can choose between “Mahara” and “Moodle”. Port number: Enter the port number that the remote application is listening at. You probably will not need to change this unless you are connecting to a https service or your remote application is running on a non-standard port. This field is required. They SSO in: Enable this option to allow users from the remote site to roam to your Mahara site without having to enter their username and password. This is the most commonly used setting. We SSO out: Enable this option to allow your users to roam from Mahara to the remote site without having to enter their username and password there. We import content: Not all network-enabled applications support this, but if they do, e.g. Moodle 2.x, this will allow users of the remote site to import content to Mahara. 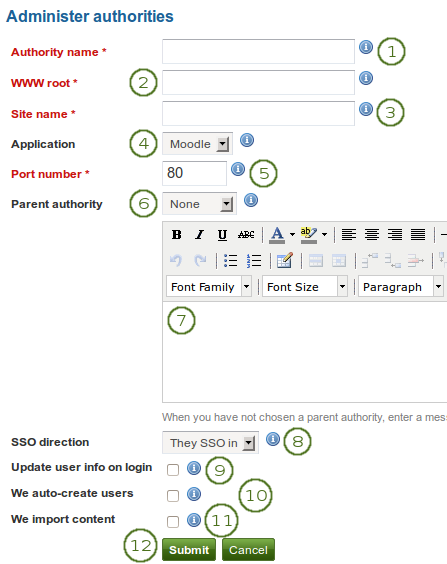 It depends on the option “They SSO in” from “SSO direction” and it is sensible to also have “We auto-create users” set. Use the up arrow and down arrow to move a specific authentication method up or down in the list. Delete a particular authentication method by clicking on the Delete link [x]. Add the users by clicking the right-arrow button . Then click the left-arrow button , and they are removed from the list. Alternatively, if you wish to decline users membership, you can select them and then send a general denial by clicking the Decline requests button. Institution: Choose from the drop-down menu to which institution you wish to invite users. If there is only one institution, its name will be displayed without the drop-down menu. Add the users to the list Users to be invited by clicking the right-arrow button . Alternatively, you can click the Add members button as site administrator and add users directly to the institution without asking them first. Institution: Choose from the drop-down menu to which institution you wish to invite users. If there is only one other institution, its name will be displayed without the drop-down menu. Users who have left institution [name of the institution]: Select the users you wish to invite or add to the other institution. Add the users to the list Users to be removed by clicking the right-arrow button . Invited users: Select the users you wish to univite from joining the institution. Add the users to the list Users to be uninvited by clicking the right-arrow button . Institution: Choose the institution from the drop-down menu for which want to give staff rights to members. 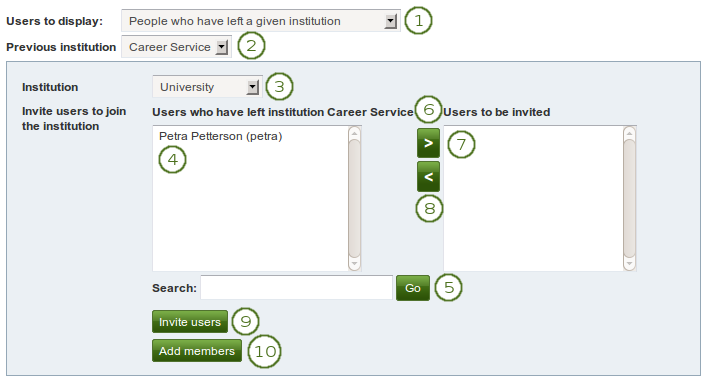 Add the users to the list Institution staff by clicking the right-arrow button . 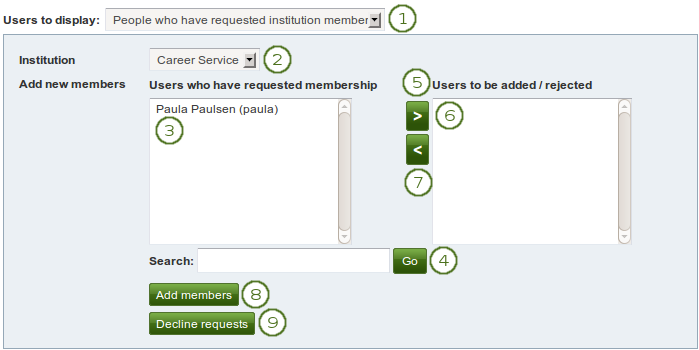 Institution: Choose the institution from the drop-down menu for which want to give admin rights to members. Institution members: Select the institution members who shall get admin rights. Add the users to the list Current admins by clicking on the right-arrow button . If you put a user into the institution admin list by accident or want to remove existing admin members and return them to normal membership status, select them. When you have all the members you wish to have as admins in the institution, click the Submit button. 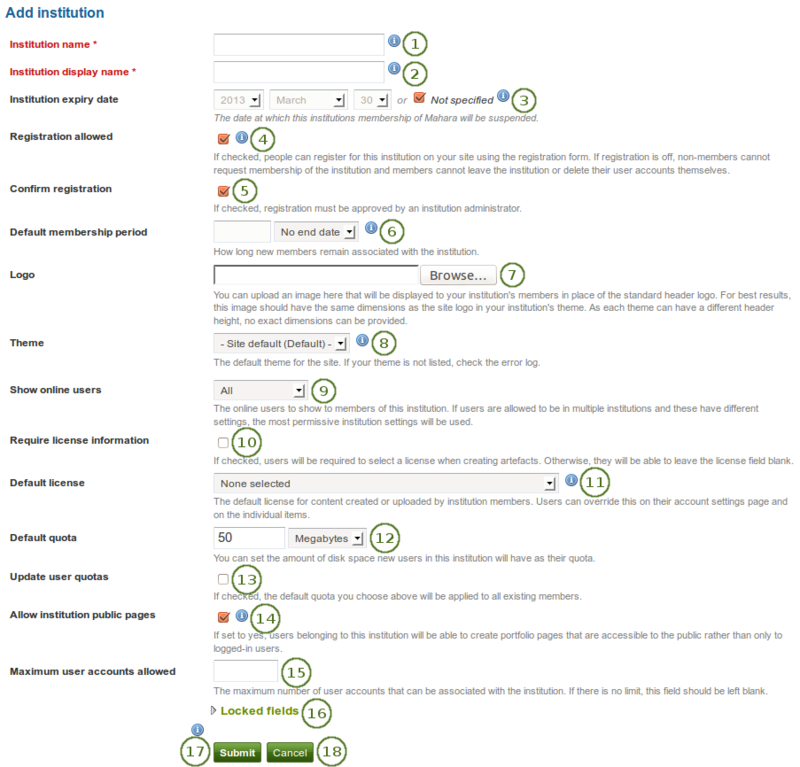 Institution: Click on the institution in the drop-down menu for which you want to create or edit institution pages. Search: If you have a lot of institution pages, you can search for a particular one here. You can search in the title, description and tags or only in tags. 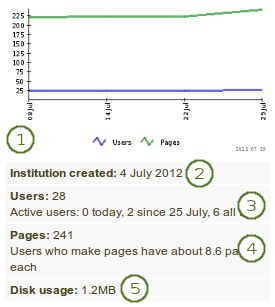 Click the Create page button to start a new institution page. Click the Copy page button to start a new page from a copy of an already existing one. This does not have to be an institution page but can be any page that you are allowed to copy. View an institution page that you have already created. Click the Edit button to change an existing institution page. click the Delete button to delete an institution page. Institution: Click on the institution in the drop-down menu for which you want to create or edit institution collections. Click the Manage button to move pages within a collection, add to or delete pages from a collection. Click the Edit button to change the title and description of a collection. Click the Delete button to delete the collection. The pages will still exist. Institution: Select the institution from the drop-down menu for which you want to see the institution pages and collections. Collections: All institution collections for that institution are listed here. Pages: All institution pages for that institution are listed here. 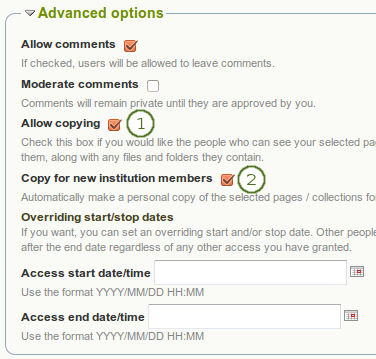 When you clicked the Edit access button on the Share page for institution pages and collections, place a tick in the check box Allow copying under Advanced options. Once you have put a check mark into that box, the line Copy for new institution members appears, and you can place a check mark into that box if you wish all new institution members to receive that page or collection automatically upon joining that institution. Registration reason: If administrator approval is required, you can provide a reason why you want to join. The self-registration process with administrator approval also works for users who wish to use Persona. It needs to be set up as authentication method, and potential users go about in a very similar way. 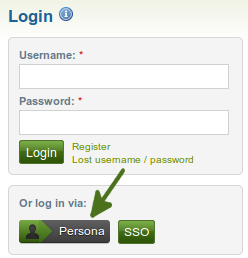 Instead of clicking the link Register, users who have a Persona account can use that to register for an institution that allows for Persona authentication. Click the Persona button . Sign in to your Persona account. Institution: Choose the institution for which you want to view the pending registrations. Institution staff: Place a check mark in this check box if the user shall have staff access rights. 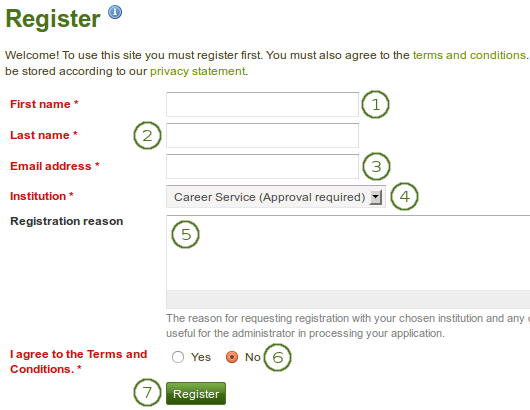 Click the Approve button when you want to approve this registration request. Click the Cancel button to abort the approval process. Click the Deny button to send a notification to the person’s email address with the reason for the denial. 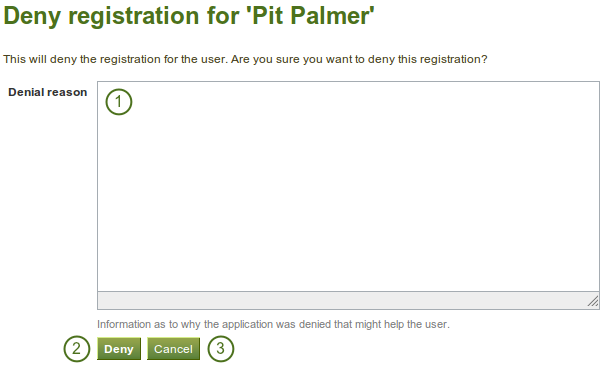 Click the Cancel button to be taken back to the page with all pending registrations.